After 3 weeks (2 ‘official’, 1 trial) living on a modern version of the wartime rations, Ryan and I are calling it a day. We’re not hungry, and we’re not bored with the food. What we’ve found is that we live within the ration of meat, fats and dairy products quite happily. I guess this is because we are flexitarians (or reducetarians), and have been consciously reducing our meat consumption for some time, bulking out meals with vegetables and/or pulses, as they would have done in wartime. (And we’ve long been barraged with health warnings about eating too much fat!) Of course, we also have the benefits of a household fridge, and an array of foodstuffs that just wouldn’t have been available in wartime, particularly as the war wore on and people’s stocks of spices and flavourings ran down. So we’re not going to bother weighing out the rations any more. But we’re not giving up on our wartime project, and I’m hoping to try at least one wartime recipe each week, and to blog them on Wartime Wednesdays. In the meantime, I have found time to pop outside and plant the garlic. I normally do so with my dibber, which in true wartime style is a repurposed porridge spurtle. It was a gift, many years ago, and as I make my porridge in the microwave, I never used it for stirring porridge. But it makes a great dibber. However, it had gone missing. 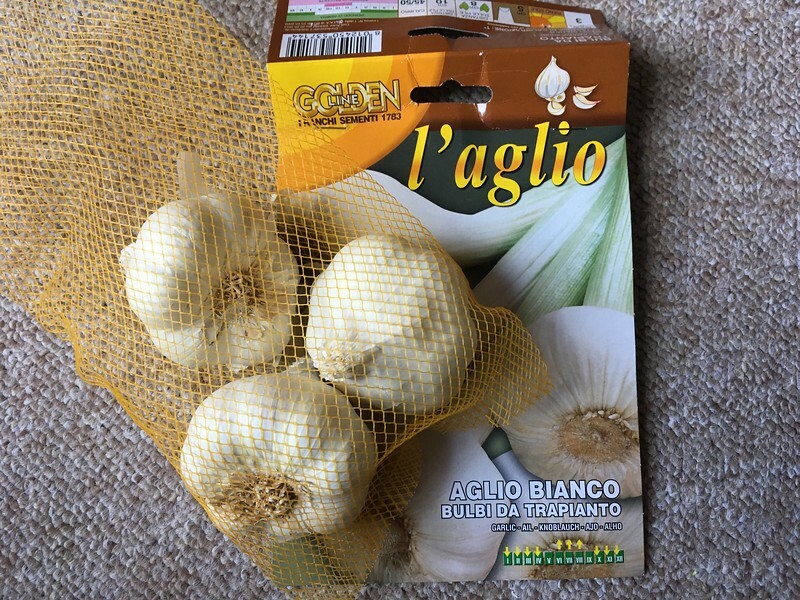 As I mentioned, I want to try planting the garlic much deeper this year – 6 inches deep – so I used a trowel to open up a slit and pushed each clove down into it. It’s easy enough in the soft soil of the raised bed. Of course, I found the dibber on the way back to the shed, perched on the edge of the last raised bed it was used in. Garlic wasn’t unheard of in 1940s Britain, but it wasn’t popular. It was mostly considered to be a medicinal product, and was used to treat battlefield wounds, but it was considered to be too smelly to actually eat. It doesn’t feature much in the growing advice of the time, but it does get a brief mention in the second Dig for Victory leaflet, so some people probably did grow it. I have yet to find a single WW2 recipe that mentions garlic. I have, however, found some interesting wartime garlic stories. The first is from the Imperial War Museums Weird War Two collection of oddities from the period. Apparently there was a concern that British secret agents weren’t entirely undetectable in Spain because they didn’t smell right, not being natural garlic eaters. And so the boffins back home thought up the idea of garlic chocolate bars for the spies, in the hope that it would disguise the flavour they just couldn’t bear to eat. There’s a record of it having been tried, but whether or not it was successful is lost to the mists of time. And in March 1941 the Manchester Guardian published a note that while garlic was becoming more popular in the wake of the onion shortage, it seemed unlikely to regain the popularity it previously had the Middle Ages, when large quantities were imported, leading to a last legacy in the street names of London dockland – as Garlick Hill and Garlickhithe. Of course, that was mostly because people thought it would save them from the plague, but I wonder whether they ever thought of growing their own? 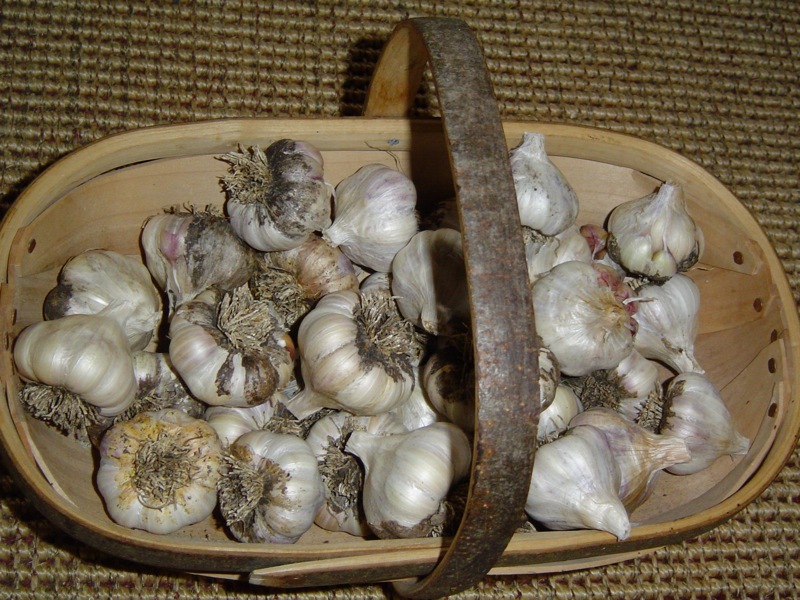 This is such a fab blog post, so fascinating to learn about the history of garlic. Garlic is so versatile and nutritious and ideal for UK weather conditions. Your wartime project is fascinating and an interesting way of interacting with history. Thanks for sharing!